SYNOPSIS: Daniel Hillard (Williams) is no ordinary father, so when he learns his ex-wife (Field) needs a housekeeper, he applies for the job. With the perfect wig, a little makeup and a dress for all occasions, he becomes Mrs. Doubtfire, a devoted British nanny who is hired on the spot. Free to be the “woman” he never knew he could be, the disguised Daniel creates a whole new life with his entire family. DVD OVERVIEW: Mrs. Doubtfire is in the house! Everyone’s favorite gender-bending nanny is back for more heartwarming hilarity as Fox Home Entertainment pulls off the wig and lets out the seams to unveil even more fun on March 4th with the all-new Mrs. Doubtfire Behind-The-Seams Special Edition two-disc DVD release. 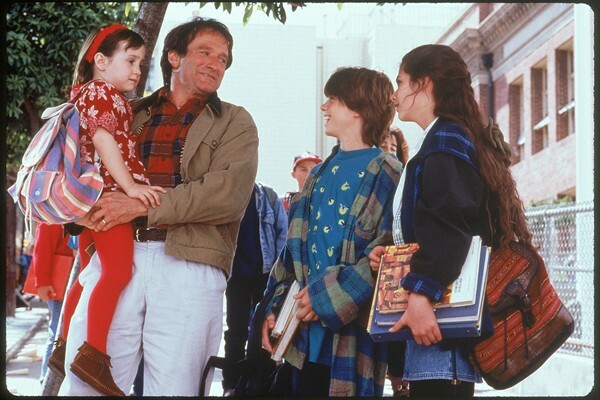 Starring the unparalleled Robin Williams in his hysterical cross-dressing, Golden Globe®-winning performance as the lovable British nanny, Mrs. Doubtfire became an instant blockbuster grossing over $440 million worldwide. Directed by Chris Columbus (Harry Potter and the Sorcerer’s Stone, Home Alone) and co-starring Sally Field (“Brothers & Sisters,” Forrest Gump) and Pierce Brosnan (The Matador, After The Sunset), Mrs. Doubtfire garnered multiple honors including an American Comedy Award® (Funniest Actor in Motion Picture), MTV Movie Award® (Best Comedic Performance), People’s Choice Award® (Favorite Comedy Motion Picture) and an Academy Award® (Best Makeup). The Mrs. Doubtfire Behind-The-Seams Special Edition DVD has plenty of surprises hidden under its skirt highlighted by hours of never-before-seen material including all-new on-camera interviews with funnyman Robin Williams; outrageous deleted scenes; numerous “on-the-set” featurettes chronicling the production process from casting to costumes and make-up tests; alternate takes showcasing Williams’ remarkable improvisation talents; a conversation with legendary animator Chuck Jones who designed the film’s credit sequences; an original 1993 featurette about the making of the film; trailers, TV spots and much more. As an added bonus for mom’s, the Mrs. Doubtfire Behind-The-Seams Special Edition DVD will also include a Movie Money coupon good for one free admission (up to $7.50) to Horton Hears A Who - debuting in theaters on March 14, 2008.